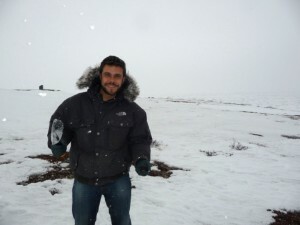 The CWHC Alberta Node wants to congratulate Guilherme (Gui) Verocai, PhD candidate under Dr. Susan Kutz, for his success on the board certification exam of the American College of Veterinary Microbiologists (ACVM), with a specialty in Veterinary Parasitology. The exams were held in Chicago on December 5th and 6th. Gui has now the title of Diplomate of the ACVM in Parasitology, which is a great career achievement. Gui has broad experience in wildlife and domestic animal parasitology, acquired through his DVM and Masters in Brazil, and his PhD at the University of Calgary. Currently, his work focuses on the biodiversity, taxonomy and biogeography of lungworms of wild ungulates. Congratulations! What’s in the coyote’s ears?